I know some of you are probably thinking I sound like chicken little. 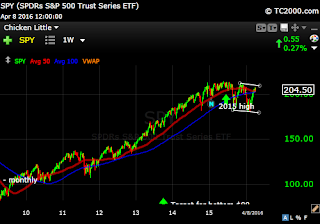 My posts are all about how bearish I am and yet the market is not significantly lower. This bear trend is unfolding pretty much as I expected. This is a long term change and takes time to develop. When I first turned bearish in December of 2014, I wrote that it would take time because the moving averages needed to flatten. I also said that market would selloff and have a series of lower lows and lower highs. That is exactly what is happening. I also wrote about how the economic data looks horrible and I could see the economy slowing even though the published data did not yet show it. You have to know how to read the actual data and not look at the "headline" numbers. I still don't understand how Wall Street has ignored the writing that is on the wall. In February, the Atlanta Fed had Q1 2016 GDP estimates at 2.7%. Just last week they had 2 revisions to their estimate. On Monday they lowered their Q1 GDP forecast to 0.7% and then on Friday they revised lower again to just 0.1%. That is a significant drop from the 2.7% forecast just 2 months ago. The GDP for Q1 will be announced on April 28th. I decided to show you a couple of charts. The first one is the current market. 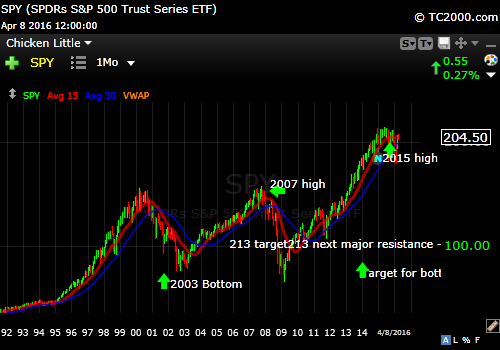 You can see the market top in 2015 and how prices flattened and now the moving averages are as well. 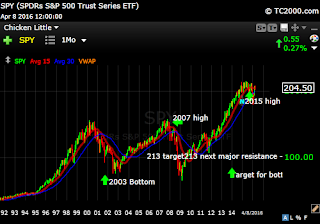 ing the chart action for the 2001, 2007, and 2015 tops all on 1 chart. As you can see we are headed in the same direction. DOWN.